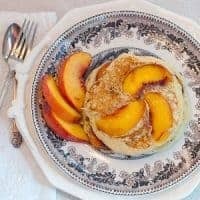 Peach Pecan Pancakes are a tribute to my home state of Georgia and the best breakfast for any day of the week! As everyone knows, Georgia is the “Peach State.” Even our vehicle license plates say so. The peach industry in Georgia has a very long tradition starting with the introduction of peaches by Franciscan monks on St. Simons and Cumberland Islands in 1571. By the mid-1700’s, peaches were being cultivated by the Cherokee Indians and by the time of the Civil War, many home orchards were flourishing. In Georgia, fresh peach season runs from May through the end of September, so we still have some of the luscious gems available. I used a few, along with another of Georgia’s largest crops, pecans, to make these Peach Pecan Pancakes. 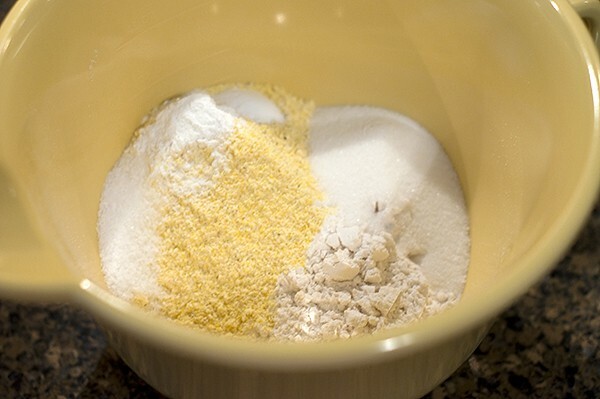 Sift together all the dry ingredients in a large bowl. You’ll notice that these pancakes use a mixture of flour and yellow cornmeal. The cornmeal gives them a really nice nutty background flavor and just a tiny bit of a crunchy texture. 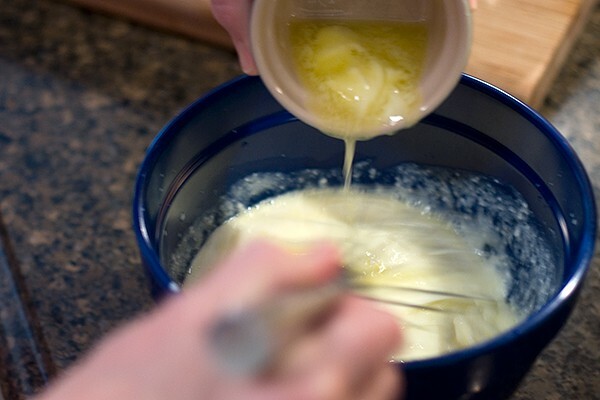 In a separate bowl, whisk together the buttermilk, eggs, and melted butter. 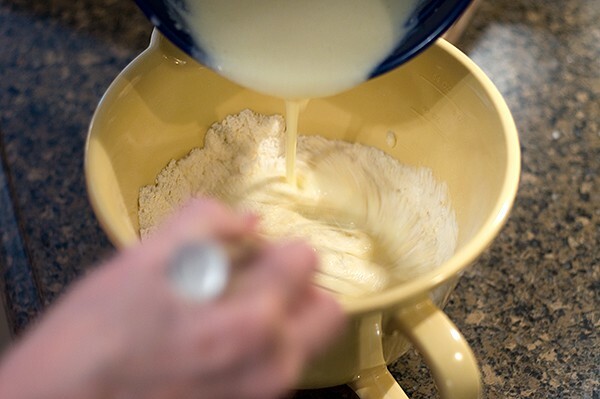 Add the wet mixture to the dry mixture whisking until just combined. 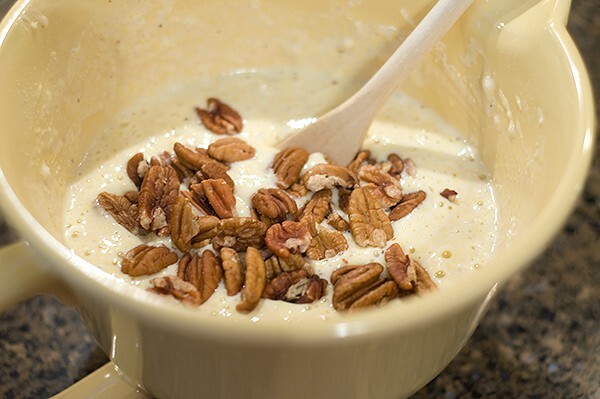 Stir in the pecans. Let the batter rest a few minutes while you melt a small amount of butter on a griddle or in a large non-stick skillet over medium heat. Place 3 peach wedges in a spokelike fashion for each pancake onto the griddle. Pour 1/4 cup batter over each group of wedges to make a pancake. Cook the pancakes for 3-4 minutes or until the tops show bubbles. Flip the pancakes and cook the other side for 2-3 minutes or until golden brown. If necessary, transfer to a baking sheet and keep warm in a low oven while finishing all the pancakes. Serve topped with syrup, powdered sugar, or whipped cream. Fresh ripe peaches and pecans make these pancakes a special breakfast or brunch treat! Sift together the first five ingredients in a large bowl. In a separate bowl, whisk together the buttermilk, eggs, and melted butter. Add the wet mixture to the dry mixture whisking until just combined. Stir in the chopped pecans. 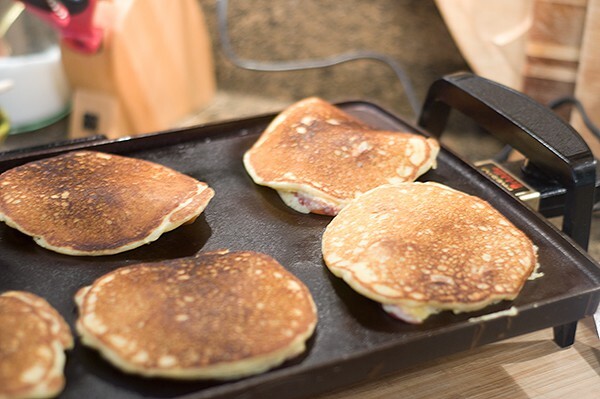 Melt a small amount of butter on a griddle or large non-stick skillet over medium heat. 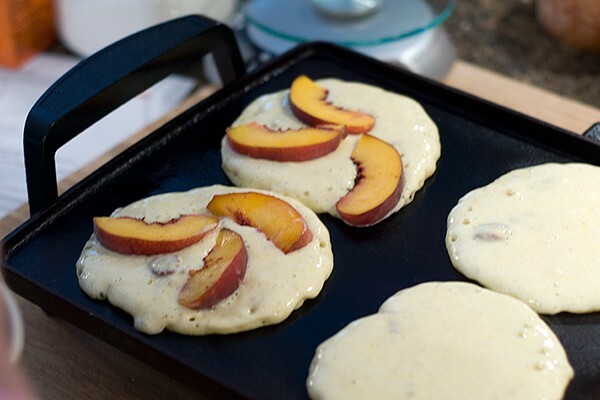 Place 3 peach wedges in a spokelike fashion for each pancake onto the griddle. Pour 1/4 cup batter over each group of wedges to make a pancake. Cook the pancakes for 3-4 minutes or until tops show bubbles. Flip and cook the other side 2-3 minutes or until golden brown. If necessary, transfer to a baking sheet and keep warm in a low oven while finishing all the pancakes. Serve topped with powdered sugar, whipped cream, or syrup. This is exactly what I want for breakfast this morning. Peaches and pecans are an awesome combo! When I went to Georgia for the first time, I hunted down fresh peaches, boiled peanuts, and pecans first thing. What a great combo! I love peaches. We had a few bushes in our yard when I was a kid, but now I always gravitate toward nectarines, especially the white ones. My husband’s aversion to peach fuzz made me switch. Can’t wait to make these pancakes, yum! I do hope you’ll give them a try, Angie. You could probably sub nectarines for the peaches if you wanted to. What a great way to highlight those beautiful Georgia peaches and to change up the usual pancakes. Perfect for Sunday brunch! Definitely a great brunch recipe, Dara. Just different enough to be very interesting. Peaches and Pecans make a perfect combo and awesome breakfast! Thanks, Brenda. I think so, too! That’s a long peach season! Consider me very jealous. ;) And these pancakes look like the perfect way to start the day! I love the added pecans. It is long, Erin, because we have so many different varieties that ripen at different times. We really fortunate! So lucky you’re still in peach season! I would totally enjoy them with breakfast like these pancakes! We’re right at the very end of the season, Anita, so I’m trying to enjoy every last minute of it!